Viktor Orbán’s face literally loomed over Brussels on Tuesday, plastered as it was on the side of a van. The idea was to denounce his brand of illiberal democracy as a ‘threat to EU values’. But are cheap stunts like this really what the EU needs ahead of May’s elections? 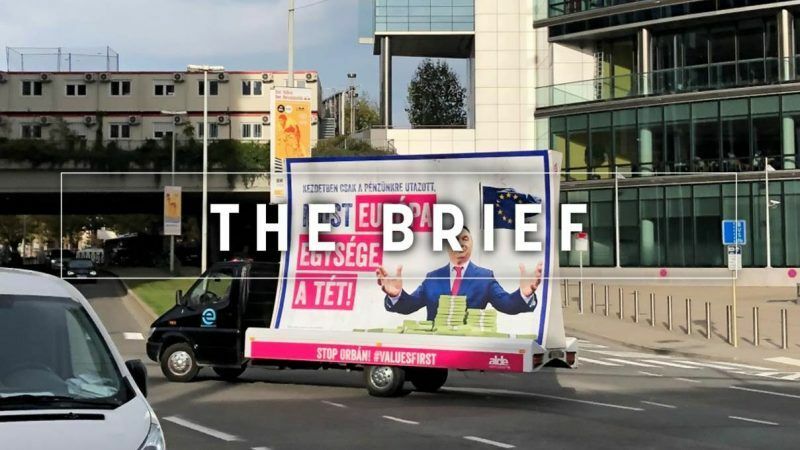 No, it wasn’t your imagination; the Orban-van was really speeding through the European quarter at a leisurely 30 km/h, as the liberal ALDE group continued its PR war against the Hungarian leader. Guy Verhofstadt was on hand to pose in front of the van, which depicted a smiling Orbán standing over a pile of cash, with an EU flag flying in the background and the words “first he took our money, now he wants to destroy Europe” emblazoned above him. After a quick tour of the European institutions, it headed over to the Hungarian embassy and is now on its way to Budapest. There can be no doubting the point ALDE is ham-fistedly making here: Orbán’s younger brother has been embroiled in a corruption case that involves EU funds and government officials reportedly charter planes and yachts for frivolous trips. But why resort to the tactics of the very populist forces ALDE wants to defeat? Standing in front of inflammatory posters is the modus operandi of the Nigel Farages of this world, men who have never held meaningful public office (or only turned up for work now and then), not committed European politicians. Sending vans around town is the recourse of a schizophrenic UK government, hell-bent on pandering to the lowest common denominator of voters, not a former Belgian prime minister. Ignoring the real issues that face society and just beating the drum of whatever flavour of the month is getting the most retweets is Trumpian, not Verhofstadtian, or even European. Of course, it was meant to remind the EPP of its problematic relationship with Orbán’s Fidesz party and the ongoing Article 7 process that has chilled Brussels-Budapest ties even further, just as the conservative group meets in Helsinki for its congress. But why bother? EPP members have all the information they need on Orbán and are either unwilling or unable to act on it. All this van succeeds in doing is confirming that the populism rulebook is now recommended reading for everyone involved in politics. Verhofstadt said yesterday that the Liberals and Democrats will “lead the counter-movement against rightwing populists who conspire to bring the EU down and remove people’s rights”. In other words, they’re going to waste all their resources fighting factions on their home turf, in the arena of migration and corruptions issues, among others. Recent history tells us that it’s not a fight the coalition of reason will win. So why aren’t pro-EU forces like ALDE taking them on in areas where their foes have no answers? Climate change, jobs of the future, external security threats to Europe: that’s where proper politicians like Verhofstadt hold all the cards. Commission president hopefuls Frans Timmermans and Alex Stubb have already tried to steer the discourse in that direction but van stunts drag it back down to where the populists want to hold the “battle for the very soul of Europe”. Driving the van down the low road just isn’t very helpful. Collaboration across research and healthcare can lead to better outcomes for patients. As the European elections loom closer, one question rings ever louder in the Brussels corridors: How will the Parliament’s main political groups choose their candidates for the EU’s top jobs? Watch here a possible playbook on the process. EPP leader Manfred Weber, a potential candidate for the top Commission job, says his party is loyal to its Christian Democratic principles and has solutions for populism and extremism. London has become a hotbed for Russian spooks. A new report endorsed by the former head of MI6 revealed the scale of Russian espionage, while the US is eyeing a second round of sanctions over the Salisbury attack. The UK’s data chief has called for an overhaul of rules on the use of digital information in political campaigning in a new report in the wake of data scandals connected to the Brexit referendum. Austria, the current holder of the EU’s presidency, will support any agreement reached by Kosovo and Serbia in the process of normalising relations, Chancellor Sebastian Kurz told Belgrade and Pristina during a mini-tour of the region. As the EU’s troublemakers, cornered by their EU partners, Italy, Hungary and the UK were welcomed with open arms by Chinese President Xi Jinping during his landmark trade event held in Shanghai in the first China International Import Expo (CIIE) this week. A ‘risk data hub’ will gather information about the risks and impacts of natural hazards of all sorts – including floods, droughts, wildfires or earthquakes. EU finance ministers call for transparency in climate finance. Meanwhile, the new Corporate Reporting Dialogue project launches a two-year transparency project on green finance to align international standards improve and harmonise reporting on them. Effective health and pharma policy needs a stronger EU Commission role, Greek Health Minister Andreas Ksanthos told EURACTIV. Science in the future of agriculture: Can innovation double food production – and improve sustainability? Remember to tweet us your best caption contest entries here too! Day 2 of the EPP Congress in Helsinki, where the party is set to pick their Spitzenkandidat contender for the 2019 European elections – with the direct confrontation this evening and the vote tomorrow. The face-off, however, brings forth some strange blossoms, though.